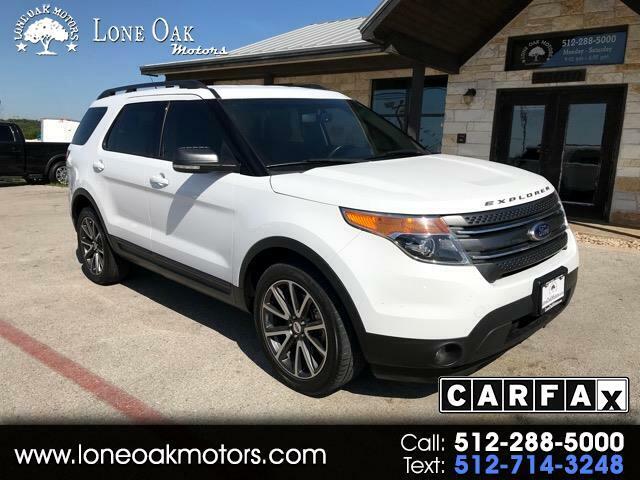 Meet the dynamic and responsive One Owner Clean Carfax 2015 Ford Explorer XLT 4WD shown in Oxford White. Our highly desirable family-friendly SUV is powered by a Turbo Charged EcoBoost 2.0 Liter 4 Cylinder that offers 240hp on demand while tethered to a smooth-shifting 6 Speed Automatic. This awesome team rewards you with near 28mpg on the open road and the sure-footed confidence of intelligent 4WD when road conditions are less than ideal. The exterior's bold design turns heads with its chrome accents, streamlined molding and overall handsome style. Our XLT is full of luxury with beautiful cloth front bucket seats with a six-way power driver's seat, second-row 60/40 split-fold-flat bench seat and a 50/50 split-folding third-row seat. The leather wrapped steering wheel with fingertip access includes five-way controls for MyFord Sync offering you the latest news, weather and tunes rocking through a premium 8 speaker audio system. Superb lighting and storage options make this just right for all your family road trips. Our Explorer is one of the safest SUVs on the market today with airbags, SOS post-crash alert, tire pressure monitoring, reverse sensing system and traction control. MyKey even allows you to set controls such as speed and volume for your teen drivers. Make our Explorer part of your family today. Print this page and call us Now... We Know You Will Enjoy Your Test Drive Towards Ownership!